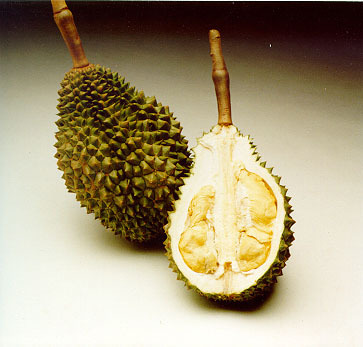 The fruit is oval in shape and big weighing between 2 - 4kg. per fruit. The skin is green to rust colour and the thorns are big. The flesh is golden yellow, thick, soft and sweet. This is the most important commercial variety in Thailand . Obtuse spikes, and the size of their heads and bottoms are typically equal to each other. 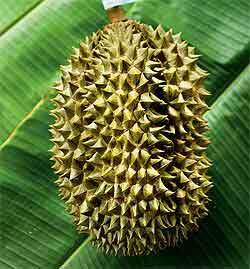 This is a popular Thai durian. The fruit looks like a gibbon hang on a tree. Taste: Sweet , strong fragrance sweet-bitter when over-ripe.